This is an English Language app that would work well both in the home and in a school setting. Giving young children the enjoyment of solving puzzles whilst also learning the sounds and recognising the letters of the alphabet, it gives the opportunity to learn whilst playing. My three year old son absolutely loved this app and so did I. It has an extremely simple idea behind it but not only does it execute it with great ease and success but the developer also has a number of fantastic features which makes the app an excellent learning opportunity. The main aim of the app is to allow young children the opportunity to begin to learn the alphabet, the sound of the different letters, what they look like and also animals related to that letter. They do this through piecing together a puzzle of the related animal. A simple enough concept but the developer has certainly made it an extremely enjoyable one too. The graphics look like they have jumped straight of the page of an award winning picture book, immediately hooking in any user, and the sounds to compliment the pictures certainly keep the user in the app rather than distracting from the overall aim. One of the key features is the usability within the app. The age range is for the younger end so it needs to be simple and this is achieved extremely well. Once the user opens the app they are welcomed to the home page where they can either go straight into the app or enter the settings page. The settings allow a user to change the difficulty level from easy to normal (this is adapting the difficulty of the puzzles, so smaller pieces for the normal selection and fewer, bigger ones for the easy). Sound and sound effects can also be turned on and off and the user can choose whether they wish for the letters to be upper or lower case. All the way through the app the high quality graphics carry on as does the ease of use within the app. No instructions are needed within the app as it is so simple to use. Once the user has the right settings selected they can then enter the main content of the app by clicking on the ‘Play’ button on the homepage. This then takes the user to another page which has the puzzles for the letters A-I. Further letter puzzles can be accessed by clicking on the arrow to the right of the images and this takes the user to the J-R puzzles. A further click on the arrow takes you to the final page of puzzles S-Z. The user can choose whichever order they would like to do the puzzle in and there is no need to unlock puzzles by completing the previous one. Therefore users can dip in and out of the app at their own pace and can redo puzzles should they wish. Once a user has selected the specific letter they wish to work on they are given the puzzle in small piece around the screen and the border of the animal they are trying to create. So by clicking on T, the turtle outline is visible but the full illustration can only be seen once all the pieces, around the edge of the outline have been dragged into place. Once the puzzle has been completed, the sound of the letter is pronounced by the app and the letters to spell the animal. Each of the letters can be clicked on so that the user can hear the correct pronunciation and the animal can also be clicked on to hear how the animal is pronounced. These are all excellent small additions that really add to the overall success of the app and certainly give it a very good learning edge due to the continued opportunities there are for learning throughout. Another excellent feature from the developer, something that would probably please educators using the app, is the developer’s usage reporting. Through quarterly reporting from the Big Clever platform, you can track usage and download reports based on how well individuals are doing within the app. This doesn’t affect the overall use of the app but what it does mean is that an educator can start to use the information to track how well their students are doing, the time they are spending on the app and the success they are having within it. Overall this is an extremely enjoyable app that has a lot of learning potential throughout it. The developer has created an app that will keep users engaged and will give them lots of ways in which they can learn the alphabet, how letters are sounded and recognise what each letter looks like. 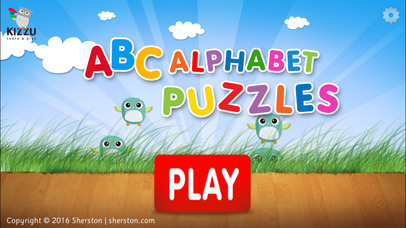 Engaging imaginary worlds help children aged between two and five learn the alphabet in this Kizzu learning game app from Sherston. 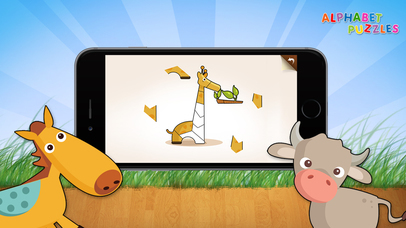 It uses HD graphics and vibrant animations and is lots of fun, as well as being educational. 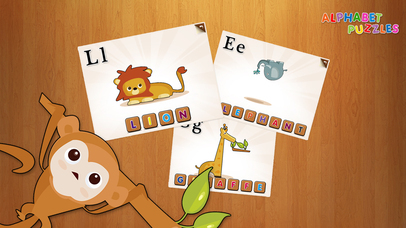 The game also helps children learn new words and shapes and to improve their spelling. All they need to do is drag the pieces of each puzzle around to create an animal picture. The app then helps the child to spell out each word. Suggested age range: 2-5 years old.